On the subway from Brooklyn to Manhattan, Rashiq Fataar is thinking about how important the process of gathering ideas is, giving meaning to these ideas and the power of giving them wings to travel. After presenting at the MAS Summit in New York last week at the Times Center I came across a wall asking the conference attendees to share ideas by completing a statement on a sheet which included, “The city I want looks like this..”, “I wish my city was designed to be more…” and a few others. After browsing through the ideas, I realised that many of them were not new to me and so I kept moving. But there is a certain risk and arrogance in not being open to ideas, even if they are not new or groundbreaking. For many people living in a city, it is still quite rare to be asked their thoughts and ideas – platforms for ideas and dialogue are still needed. As an organisation, it is understandable that with the demands of multiple projects and collaborations, the process of ideation about our neighbourhoods and cities – and even our organisation – can be relegated to a strategy session buried somewhere in our year planner. Gathering ideas in different contexts and through different tools can add immense value. In a city or country where top-down planning was the dominant approach for much of the last century, creating a space for citizens to share ideas is a contribution towards democratic processes. In some cases, ideas can lead to action or a physical investment, and in others they are a way of lobbying for change – ideally inspiring citizens not only to think about their city differently, but to act on these thoughts. Stepping back and reviewing a wall of ideas can present trends and insights about the sense of optimism (or pessimism) shared by residents in a particular neighbourhood. I also participated in the Urban Thinkers Campus along with former team member Anna Brown, hosted at the incredible New School building. The event was a special initiative of the World Urban Campaign and UN-Habitat, developed to gather ideas from people around the world who are passionate about the future of cities. The ideas developed at the UTC will feed into the World Urban Campaign’s City We Need process, and the agenda and outcome document of the Habitat III Conference. At the campus, I participated in intense 1-hour ‘urban labs’: the first on creating a just city, and the second on resilient design for sustainable urbanisation. I engaged with the policymakers, activitists, urbanists and students present. In this case, ideas were gathered, and the goal was specifically to produce two recommendations – which would then be supported in the campaign building up to Habitat III in Quito, Ecuador next year. This event takes place every two decades, and is thus a seminal occasion for internal debate on a truly planetary scale. (You can read more about creating a just city at the great essay series by Next City here). Back in Cape Town, I challenged Brett and Christine to join me in coming up with 30+ ideas for our own neighbourhoods, and share some of these ideas with our partners on a large sheet, leaving some blank spaces for them to add ideas too. I was surprised and pleased to realise that some of them would certainly never have been asked a year ago, before we started our research. In particular, I can see the impact of the fine-grained observations we have been doing, and the quantitative research we have been trialling, at Sea Point Library. The competition we have administed on behalf of Blok urban living at the Sea Point Library and Civic Centre site is now over, and we will be announcing the winners – and sharing the incredible work generated – soon. On two different weekends, our international correspondent Carolina found herself in two different Italian cities – that’s apart from attending the 3rd World Forum on Local Economic Development in Turin. First, she hopped on a train to Milan to participate in the #nevicata14Lab, where I shared our research ideas on two public space projects via Google Hangouts. During the second weekend, in Florence, she added her voice and ideas to the OurCities event, discussing the future of European cities with other European youth. And don’t miss the great ideas for transport and in particular, Langa Station by Catherine, Maitland Station by Brittany and ideas for planning a cycling city in Cape Town by Brett. Tomorrow, Kim Dovey, Professor of Architecture and Urban Design at the University of Melbourne, Australia engages our Young Urbanists about the challenge of informal settlements and urban design. In the next week I’ll be back in Cape Town before I head to Berlin for the second leg of the Urban Innovation Lab, Christine returns from a much needed break, and Brett takes a Cape Town-London-Miami-Medellin flight to spark new collaborations in the transformed Colombian city. 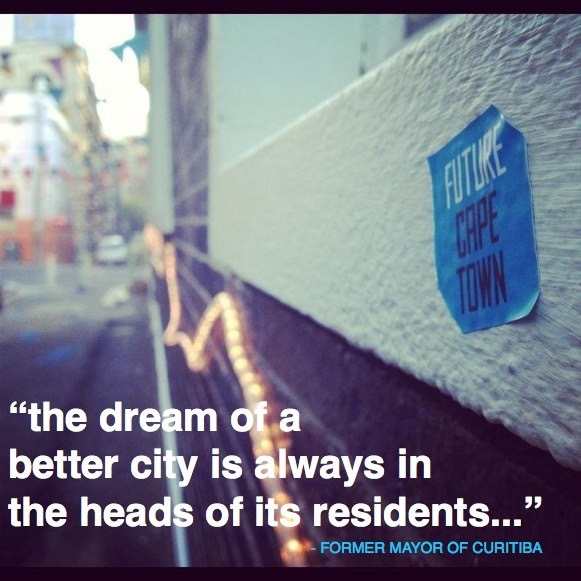 As always feel free to get in touch (hello@futurecapetown.com) or (christine@futurecapetown.com) and share your ideas for both our cities and our platforms.